If you need mulch, topsoil and other landscaping materials delivered to your Saratoga Springs home or business, The Dirt Bag has you covered. We deliver a full range of rock, gravel, garden soil, play sand, mulch and more in Saratoga Springs and throughout northern Utah. You can order your materials in bulk or choose our convenient bagged products. We are known for the exceptional quality of our landscaping materials, all at amazingly low prices. We also offer our lush, native Utah turfgrass sod, to ensure that one call to The Dirt Bag gets you everything you need for your gardening and landscaping projects. If you would like to buy your landscaping materials in bulk, you’re in luck. 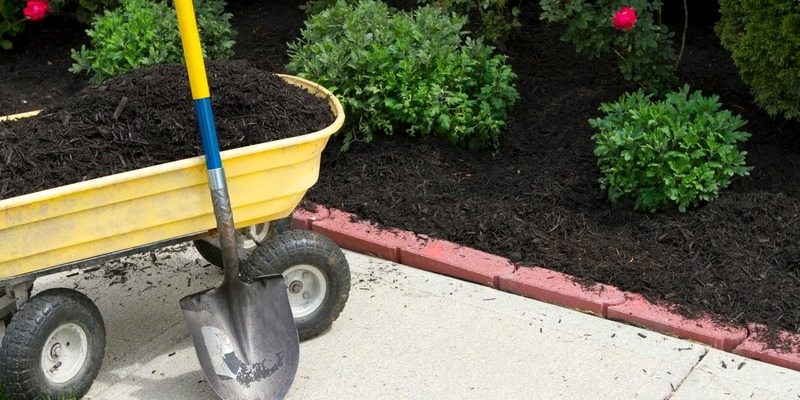 For a nominal delivery fee, we will bring you garden soil, black mulch, brown mulch, shredded bark mulch, play sand, topsoil or soil conditioner. Or choose our local favorite, Organic Mountain Compost, an exceptional soil conditioner, custom blended to improve Utah’s challenging native soils. We also offer a variety of rock, gravel and cobble, in the sizes and colors you demand. Call us or drop by our yard to order your bulk landscaping materials in Sarasota Springs. Order by the cubic yard and tell us where you’d like your products delivered. We charge only a small delivery fee for bulk materials, based on the size of your order. Here at The Dirt Bag, we’re best known for our bagged landscaping products. You can choose from dozens of fine quality products packed in heavy-duty, reusable one-cubic-yard bags. Garden soil, mulch, play sand, compost, wood chips and shredded bark are just some of the products you’ll need for your garden and landscape. We deliver our bagged product free to Saratoga Springs and throughout Salt Lake County, so you’ll never have to lug your bagged dirt, mulch or compost in and out of your car again. This year, save your back and call The Dirt Bag for free delivery. Throughout northern Utah, The Dirt Bag is known for our lush native Utah sod. And, just like all our landscape products, we will deliver you sod to the location of your choice. Just order a minimum of four pallets (2,160 square feet) and we will order your sod to be harvested. We will bring it to you in easy-to-handle rolls that are approximately 2 ft. x 5 ft. We charge only a small delivery fee, unless you purchase 10,000 square feet or more – then we will waive the delivery charge. When you need bagged and bulk landscaping materials in Saratoga Springs, this is one Dirt Bag you will love.